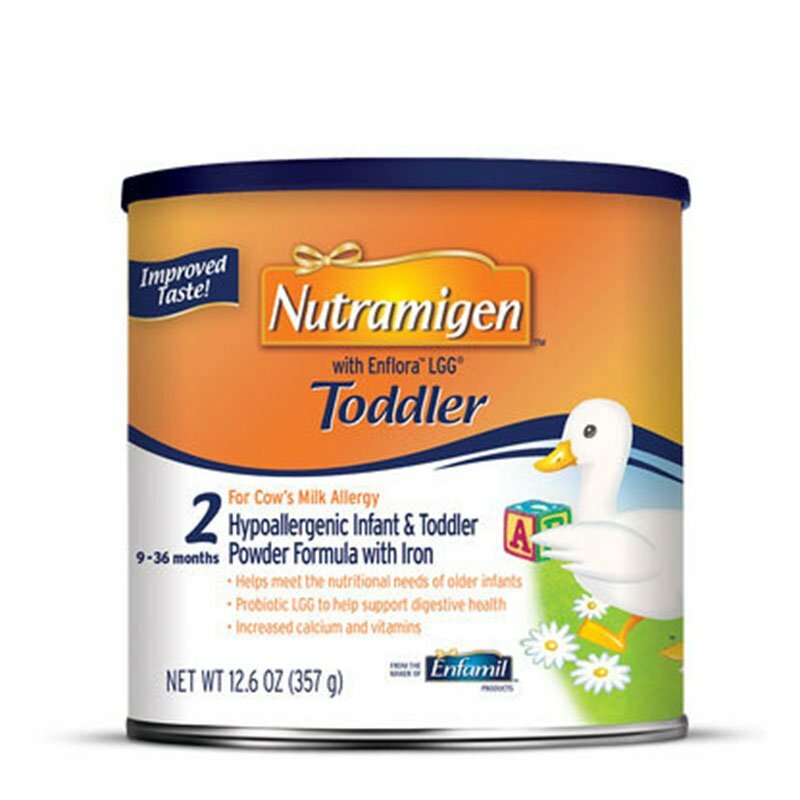 You are buying Enfamil Nutramigen With Enflora LGG Toddler Formula 12.6oz Each, Model #4893467. ADW Diabetes offers a complete line of Enfamil baby formula products both in liquid and powder form. We offer these items in both single and discounted bulk quantities for your convenience.Shop with ADW Diabetes as we provide excellent customer service, low prices, and fast shipping! The Enfamil Nutramigen With Enflora LGG Toddler Formula 12.6oz is clinically proven to manage colic due to cow's milk allergy fast, often within 48 hours while still providing the complete nutrition your baby needs to reach key milestones. Clinically proven in over 70 studies. Provides complete nutrition for your baby's first year. Powdered form includes Probiotic LGG to help support digestive health. DHA and ARA to promote brain and eye development. Corn Syrup Solids (45%), Vegetable Oil (Palm Olein, Soy, Coconut, and High Oleic Sunflower Oils) (26%)m Casein Hydrolysate* (From Milk) (17%), Modified Corn Starch (7%), and Less Than 2%: Mortierella Alpina Oil(ARA), Crypthecodinium Cohnii Oil(DHA), Lactobacillus Rhamnosus GG (LGG), Vitamin A Palmitate, Vitamin D3, Vitamin E Acetate, Vitamin K1, Thiamin Hydrochloride, RiboFlavin, Vitamin B6 Hydrochloride, Vitamin B12, Niacinamide, Folic Acid, Calcium Pantothenate, Biotin, Ascorbic Acid, Choline Chloride, Inositol, Calcium Citrate, Calcium Hydroxide, Calcium Phosphate, Magnesium Oxide, Ferrous Sulfate, Zinc Sulfate, Manganese Sulfate, Cpric Sulfate, Sodium Iodide, Sodium Selenite, Sodium Citrate, Potassium Citrate, Potassium Chloride, L-Cystine, L-Tyrosine, L-Tryptophan, Taurine, L-Carnitine.